One of the challenges faced by our customers—especially those in highly regulated industries—is balancing the need for security with flexibility. In this post, we cover how to enable multi-tenancy and increase security by using EMRFS (EMR File System) authorization, the Amazon S3 storage-level authorization on Amazon EMR. Amazon EMR is an easy, fast, and scalable analytics platform enabling large-scale data processing. IAM Roles for EMRFS authorization provides Amazon S3 storage-level authorization by configuring EMRFS with multiple IAM roles. With this functionality enabled, different users and groups can share the same cluster and assume their own IAM roles respectively. Simply put, on Amazon EMR, we can now have an Amazon EC2 role per user assumed at run time instead of one general EC2 role at the cluster level. When the user is trying to access Amazon S3 resources, Amazon EMR evaluates against a predefined mappings list in EMRFS configurations and picks up the right role for the user. In this post, we will discuss what IAM Roles for EMRFS is (Amazon S3 storage-level access control) and show how to configure the role mappings with detailed examples. The user will then have the desired permissions in a multi-tenant environment. We also demo Amazon S3 access from HDFS command line, Apache Hive on Hue, and Apache Spark. Users must be authenticated, because EMRFS needs to map the current user/group/prefix to a predefined user/group/prefix. There are several authentication options. In this post, we launch a Kerberos-enabled cluster that manages the Key Distribution Center (KDC) on the master node, and enable a one-way trust from the KDC to a Microsoft Active Directory domain. The application must support accessing Amazon S3 via Applications that have their own S3FileSystem APIs (for example, Presto) are not supported at this time. EMRFS supports three types of mapping entries: user, group, and Amazon S3 prefix. Let’s use an example to show how this works. In this case, you create a separate Amazon EC2 role that doesn’t give any permission to Amazon S3. Let’s call the role the base role (the EC2 role attached to the EMR cluster), which in this example is named EMR_EC2_RestrictedRole. Then, you define all the Amazon S3 permissions for each specific user or group in their own roles. The restricted role serves as the fallback role when the user doesn’t belong to any user/group, nor does the user try to access any listed Amazon S3 prefixes defined on the list. We are assuming the admin user has access to all buckets in this example. First, the admin user admin1 tries to log in and run a command to access Amazon S3 data through EMRFS. The first role emrfs_auth_user_role_admin_user on the mapping list, which is a user role, is mapped and picked up. Then admin1 has access to the Amazon S3 locations that are defined in this role. Then a user from the data engineer group (grp_data_engineering) tries to access a data bucket to run some jobs. When EMRFS sees that the user is a member of the grp_data_engineering group, the group role emrfs_auth_group_role_data_eng is assumed, and the user has proper access to Amazon S3 that is defined in the emrfs_auth_group_role_data_eng role. Next, the third user comes, who is not an admin and doesn’t belong to any of the groups. After failing evaluation of the top three entries, EMRFS evaluates whether the user is trying to access a certain Amazon S3 prefix defined in the last mapping entry. This type of mapping entry is called the prefix type. If the user is trying to access s3://emrfs-auth-default-bucket-demo/, then the prefix mapping is in effect, and the prefix role emrfs_auth_prefix_role_default_s3_prefix is assumed. If the user is not trying to access any of the Amazon S3 paths that are defined on the list—which means it failed the evaluation of all the entries—it only has the permissions defined in the EMR_EC2RestrictedRole. This role is assumed by the EC2 instances in the cluster. In this process, all the mappings defined are evaluated in the defined order, and the first role that is mapped is assumed, and the rest of the list is skipped. Now that we know how IAM Roles for EMRFS role mapping works, the next thing we need to think about is how we can use this feature in an easy and manageable way. Many customers manage their users and groups using Microsoft Active Directory or other tools like OpenLDAP. In this post, we create the Active Directory on an Amazon EC2 instance running Windows Server and create the users and groups we will be using in the example below. After setting up Active Directory, we use the Amazon EMR Kerberos auto-join capability to establish a one-way trust from the KDC running on the EMR master node to the Active Directory domain on the EC2 instance. You can use your own directory services as long as it talks to the LDAP (Lightweight Directory Access Protocol). To create and join Active Directory to Amazon EMR, follow the steps in the blog post Use Kerberos Authentication to Integrate Amazon EMR with Microsoft Active Directory. After configuring Active Directory, you can create all the users and groups using the Active Directory tools and add users to appropriate groups. In this example, we created users like admin1, dataeng1, datascientist1, grp_data_engineering, and grp_data_science, and then add the users to the right groups. For clusters with Kerberos, Amazon EMR now supports automated Active Directory domain joins. You can use the security configuration to configure the one-way trust from the KDC to the Active Directory domain. You also configure the EMRFS role mappings in the same security configuration. We will also provide an example AWS CLI command that you can run. Now you have configured Kerberos and IAM Roles for EMRFS. Additionally, you need to configure Hue with Active Directory using the Amazon EMR configuration API in order to log in using the AD users created before. The following is an example of Hue AD configuration. Note: In the preceding configuration JSON file, change the values as required before pasting it into the software setting section in the Amazon EMR console. Now let’s use this configuration and the security configuration you created before to launch the cluster. In the Amazon EMR console, choose Create cluster. Then choose Go to advanced options. On the Step1: Software and Steps page, under Edit software settings (optional), paste the configuration in the box. The rest of the setup is the same as an ordinary cluster setup, except in the Security Options section. In Step 4: Security, under Permissions, choose Custom, and then choose the RestrictedRole that you created before. Choose the appropriate subnets (these should meet the base requirement in order for a successful Active Directory join—see the Amazon EMR Management Guide for more details), and choose the appropriate security groups to make sure it talks to the Active Directory. Choose a key so that you can log in and configure the cluster. Most importantly, choose the security configuration that you created earlier to enable Kerberos and IAM Roles for EMRFS for Amazon S3. You can use the following AWS CLI command to create a cluster. Note: If you create the cluster using CLI, you need to save the JSON configuration for Hue into a file named hue-config.json and place it on the server where you run the CLI command. After the cluster gets into the Waiting state, try to connect by using SSH into the cluster using the Active Directory user name and password. id [user name] shows the mapped AD users and groups in Linux. hdfs groups [user name] shows the mapped group in Hadoop. Both should return the current Active Directory user and group information if the setup is correct. Now switch to a user from the data engineer group. Retry the previous command to access the admin’s bucket. It should throw an Amazon S3 Access Denied exception. When you try listing the Amazon S3 bucket that a data engineer group member has accessed, it triggers the group mapping. It successfully returns the listing results. Next we will test Apache Hive and then Apache Spark. To run jobs successfully, you need to create a home directory for every user in HDFS for staging data under /user/<username>. Users can configure a step to create a home directory at cluster launch time for every user who has access to the cluster. In this example, you use Hue since Hue will create the home directory in HDFS for the user at the first login. Here Hue also needs to be integrated with the same Active Directory as explained in the example configuration described earlier. 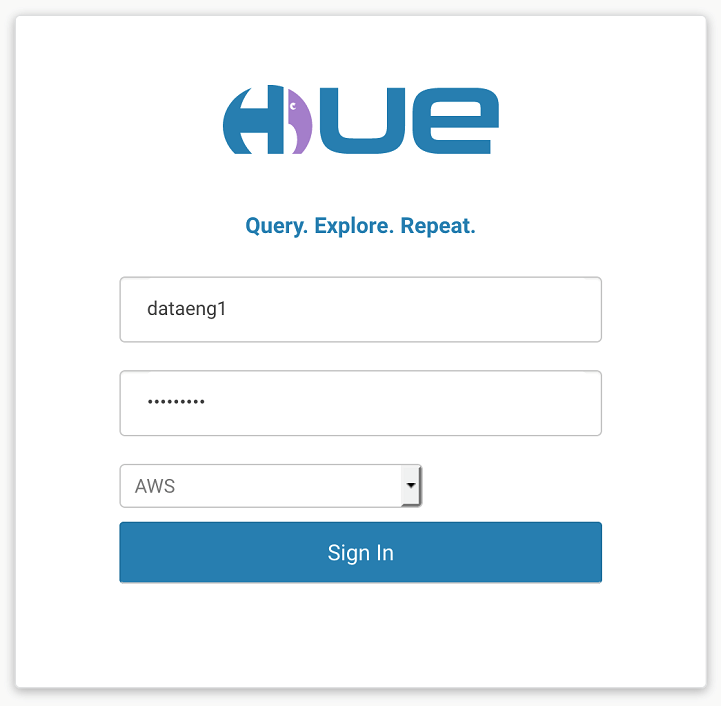 First, log in to Hue as a data engineer user, and open a Hive Notebook in Hue. 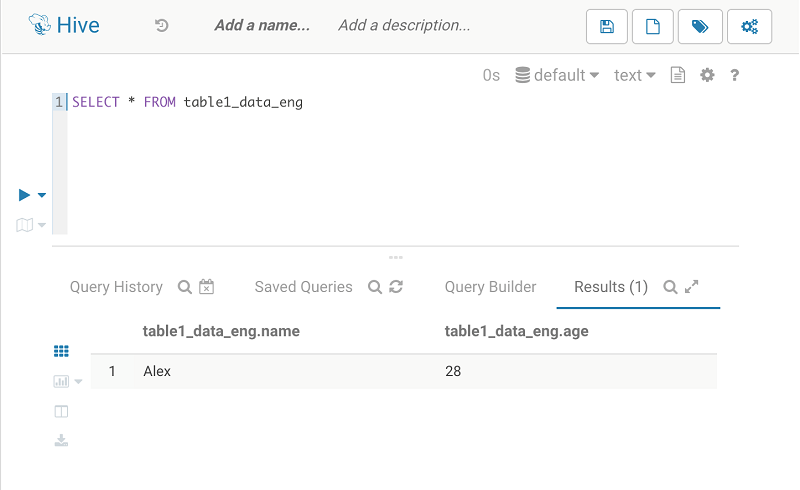 Then run a query to create a new table pointing to the data engineer bucket, s3://emrfs-auth-data-engineering-bucket-demo/table1_data_eng/. You can see that the table was created successfully. Now try to create another table pointing to the data science group’s bucket, where the data engineer group doesn’t have access. It failed and threw an Amazon S3 Access Denied error. Now insert one line of data into the successfully create table. Next, log out, switch to a data science group user, and create another table, test2_datasci_tb. The last task is to test Spark (it requires the user directory, but Hue created one in the previous step). Now let’s come back to the command line and run some Spark commands. Start the SparkSQL interactive shell by typing spark-sql, and run the show tables command. It should list the tables that you created using Hive. As a data science group user, try select on both tables. You will find that you can only select the table defined in the location that your group has access to. IAM Roles for EMRFS enables you to have multiple roles on the same cluster, providing flexibility to configure a shared cluster for different teams to achieve better efficiency. The Active Directory integration and group mapping make it much easier for you to manage your users and groups, and provides better auditability in a multi-tenant environment. 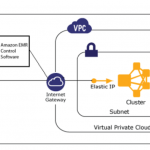 If you found this post useful, be sure to check out Use Kerberos Authentication to Integrate Amazon EMR with Microsoft Active Directory and Launching and Running an Amazon EMR Cluster inside a VPC. Songzhi Liu is a Big Data Consultant with AWS Professional Services. He works closely with AWS customers to provide them Big Data & Machine Learning solutions and best practices on the Amazon cloud.